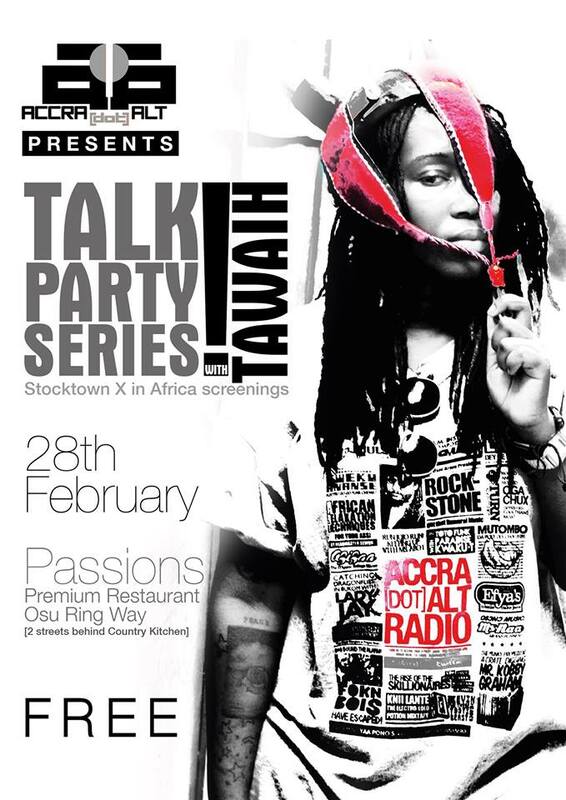 Our first Talk Party for 2016 featured one of Ghana’s most creative young thinkers, Yaw Prempeh, a superb Electronic music producer and sound artist. Science fiction is a recurring motif in the music of Yaw P and his Guy Guy Music mate Steloo. Yaw’s take on African Electronics as the next wave of transformative energy imagines Ghanaian and West African bodies in a cybernetic fantasy of humans collaborating with robots [drones] to protect these bodies within an idea of a non-oppressive State. Drones, as far as we are concerned in this part of the world represent two things: aerial photography and mass killings disguised as a “war on terror”. The latter is more prevalent, so of course, when Yaw Prempeh introduced us to his Drone Scrape Program at CHALE WOTE 2015, it begged a bunch of questions. Why was this weapon of terror – that had become synonymous with Obama’s foreign policy – become a subject of art and political theory.? Not long ago the Obama administration bombed 150 people in Somalia, claiming they were terrorists. These nameless people according to the U.S. government were at a graduation ceremony to collect their degrees in “terrorism studies” before they were literally blown away by killer drones. This is then repeated throughout the international media’s biased reporting which for the most part situates these Somalian bodies under “enemies of the U.S. who deserve to be bombed”. Suffice to say there is still no evidence these 150 people were planning any acts of terror. They could have been people at a wedding ceremony for all we know. It certainly wouldn’t be the first time the U.S. has bombed innocent people as part of state-sanctioned mass killing campaigns. However, Yaw P’s Drone Scrape Program tells of a future where a neoliberal political elite hijacks surveillance drones for purposes other than what they were designed for, until a counter revolution takes over and reprograms the drones. This framework of African Electronics has an inherent critique of contemporary Ghanaian politics that is rooted in hyper-capitalist social stratification. It’s a system of meaning-making and historical production that transcends postcolonial Ghana and rewrites what it means to be Ghanaian and African. At the Talk Party, Yaw P shared how he imagined drones progressively and in a manner that subverts its oppressive force and divisiveness. The Drone Scrape Program was imagined as a reflection of Ghanaian and African genius and rooted within an enlightening perspective of what could be possible in Ghana. The 2054 Drone Scrape Program is one that actually protects Black lives. Yaw’s drone program finds a new purpose outside of illegal surveillance and mass killings within the subregion. A.D.A intern Elorm at the Talk Party. He curates Highlife history for the Sabolai Radio Instagram. This imagined take on a drone program gone rogue in Ghana draws from the country’s current political crisis of high stakes corruption within the State and offers a beautiful re-imagination of reality from a creative consciousness that upholds ideals of liberation and love. Such an ideology is needed in a West Africa that is gradually being erased by unequal distribution of wealth by rogue politicians and systems. Previous articleAre We Marching Right?